Climb Right's climbing spurs feature a patented design which gives that strength, durability and style! Unlike 1-piece climbers, these utilize a 2-piece design with a lower "J" portion that is precision milled to exact tolerances. It is then matched to an aerospace grade aluminum upright. These climbers also use Climb Right's "Quick Change" gaffs. These forged gaffs use a rapid-change 2-screw design that enables the operator to switch or replace the gaffs with ease. Another great feature is the dual purpose "Grip Strip" on the bottom of the lower "J" portion. This patented feature provides added traction while walking on tree limbs, and doubles as a wear strip to inform you when it's time you replace your spurs. Climb Right is the brand of spur we sell most, and the brand we feature in our Tree Climbing Kits. We've sold hundreds of pairs over the years with positive feedback. Additionally, these spurs are made right here in the U.S.A.! 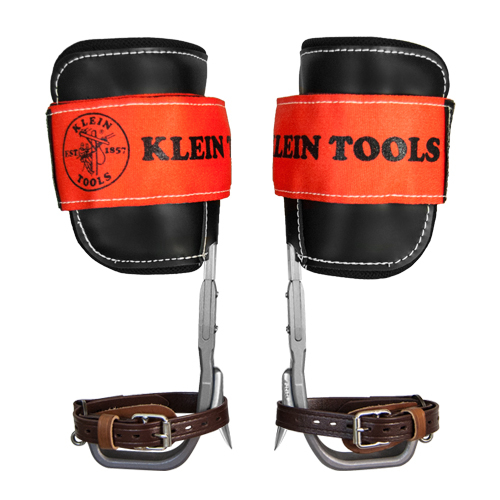 Calf adjustment from 15-3/4" - 18-3/4"
Is a stronger material, like nylon, available to upgrade the leather foot straps? There are some "new" nylon foot straps available, but we have not received stock yet. Should be in the next 2-4 weeks. I do not know that they are stronger, but they are now on the market. Pricing TBD.